TopBox has consistently been a excellent beauty subscription box. They generally have great products, their shipping is super fast and they are a Canadian based company. TopBox costs $12/month, shipping included (but plus tax) and they offer multiple month subscription in 3,6 and 12 month increments. There are typically 4 beauty samples in each package. Sometimes with the special package there can be fewer items but still within a generous value point. 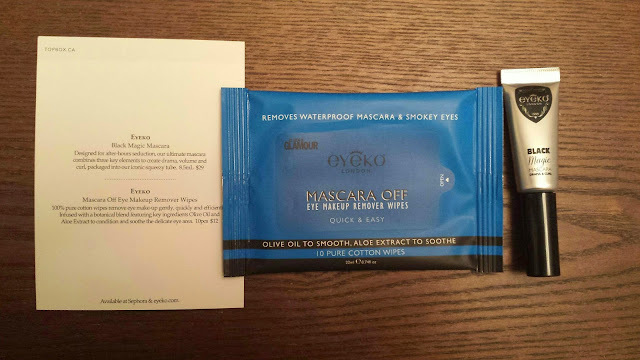 This month I selected the Eyeko option. 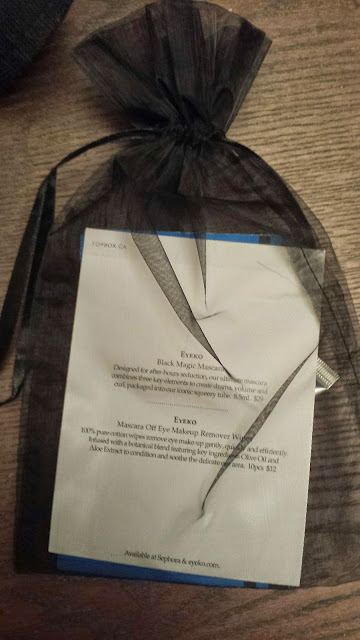 In the lovely black organza bag was the Black Magic Mascara and the Mascara Off Eye Makeup Remover Wipes. The Black Magic Mascara is actually the same one I received from TopBox in November 2014. That said, I liked it so much that I wanted a little stash. It is super black and inky. Two coats of this on my lashes is perfect for my daytime routine. An 8.5ml tube costs $29. The Makeup Remover Wipes are actually new to me. The card professes that these cotton wipes remove eye Makeup gently. A pack of 10 costs $12. Another very good TopBox for January. I am definitely happy I resubscribed! I've never tried that mascara but sounds like it's worth putting on my wishlist! I received the remover wipes as well, along with some skincare.